The cherry blossom trees in Sumida Park in Asakusa between the Azumabashi and Sakurabashi bridges are nationally famous, and rightly so, the 640 cherry blossom trees lining both sides of the Sumida river in late March and early April are truly spectacular. There are up to 50,000 visitors each day when the cherry blossom is in full bloom so can get a bit hectic if you do not have a spot reserved to sit and relax, but at night there is a real party atmosphere. With Japanese cherry blossom festivals you need to come well prepared with food and drink – kara-age chicken is a favourite with the Metropolis team (and the rest of japan). 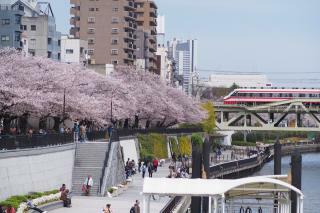 There is a long history of cherry blossom viewing along the Sumida River going back to the edo period. When you take part you will be doing the same as has been happening every year going back to way back when.